This vacation cottage pool house is built on a lush green 5 acre estate surrounded by pastoral views. This second story cottage overlooks the 24 by 48 foot modern salt pool, kiddie pool, and spa and boasts a full length sunny patio on the second story and a deeply shaded pavilion with comfortable cushioned patio furniture at pool level. The pavilion is complete with with barbeque facilities, a generous outdoor stone fireplace and a second downstairs, outside accessible pool bathroom and shower. The pool house is one bedroom with a plush queen pillow top mattress, down pillows, and Egyptian cotton high thread count bedding. A sofa bed provides additional sleeping accomodations for a total of up to four adults. The bedroom has an adjoining all tile bathroom with a large double headed shower, granite counter tops, and extra large capacity washer and dryer. This modern kitchenette has a large farm style apron front sink, convection microwave oven, Fagor Double Burner Induction cooktop, new Sur La Table Tri Ply Stainless Steel cookware, a beautiful set of porcelain dishes, double drawer Fisher-Peykel dishwasher, double drawer refrigerator freezer with ice maker, generous white cabinets, travertine backsplash, and granite countertop, all in neutral colors complete the old world look. The living room, with darkly stained hand hewn beams, walnut colored genuine hardwood floor is surrounded by windows that overlook the pool and surrounding country side. Living room seating includes a couch, love seat and two wingback chairs by the second stone fireplace for lounging, reading or even watching the 42' flat screen satellite TV. Ceiling fans throughout as well as central heat and air conditioning. Couches can be used for additional sleeping area for young ones. Pool house overlooks a 50 foot grassy paddock available to folks who come to ride the many endurance trails. Check on your horse from the deck as often as desired. Poolhouse is very nicely appointed. The pool is not heated, except upon five days advance notice and and upon payment of an extra fee for the 500 gallons of propane required to heat it. Pets will be considered on a individual basis. My wife Jeanne and I met when we were young and have enjoyed a fairy tale romance ever since. We enjoy providing wholesome accommodations and hospitality to others. If you stay in our pool house, you can expect a wonderful time. We provide farm fresh eggs from our own chickens. It is beautiful, well appointed, and we appreciate our guests. The greatest compliment that most of our guests give is spending time at the pool and pool house instead of running off. Just think of the times when you absolutely loved your accommodations. That is what you will find here at our place. We have a lovely and romantic two headed shower. Fun for young and for those young at heart. Beautiful views of rural countryside and gardens. Peaceful pasture views as well as the pools and grounds. Cattage overlooks pool and spa. The home has excellent central heating and air conditioning, triple e windows, luxurious blinds, and extra insulation for your comfort. central heating and air, and gas fireplace in the living room and outside in the pavilion. Linens are provided, including romantic full robes for swimming. Wifi with 802.11 b/g is easy for both PCs and for Mac computers. It also works very well with wifi enabled smart phones like the Iphone. Beautiful living room with fireplace. Beautiful dishes, pans, and glasses. Two burner induction portable cooktop, two drawer uline refrigerator, convection oven microwave, two drawer dishwasher. (3) 42' Dish satellite TV HD in living room and standard definition TV in bedroom. One outside TV. Variety of books, including books about the area. French doors from the Vacation Rental Pool House open onto a 300 square foot balcony looking over the pool area. Large outdoor stamped and stained concrete patio. 24 by 48 pool salt pool with waterfalls. 3 1/2 deep in shallow end and 9 1/2 feet deep in deep end. Tile race lines. Pool is not heated. Double shower, 300 square foot balcony overlooking pool, heated spa, wading pool, ranch views, upscale accommodations, outside and indoor gas rock fireplaces, large covered area near pool, park like surroundings, paddock for up to two horses, and outdoor barbeque area, two children could sleep in the living room on the airbed, couches or wood floor. A Very Cozy Peaceful Cottage! My wife and my dog and I stayed here and we couldn’t have been happier. The owner was waiting to greet us when we arrived and he was super nice and available by phone or text if you have any questions. It was immaculate inside and and appears to be a no expenses spared cottage. Who ever built it took their time to make it something special. Very classy interior and it was so quiet we felt like we were the only people around. It was Dec. when we visited so we didn’t get to take advantage of the beautiful pool facility but it was a nice part of our view. We have relatives in Auburn and will definitely want to stay here again when we’re up to visit. We stayed at R & J's pool house and it was wonderful. Swam during the day and hot tub in the evening. Not much else one can ask for. Picked this because of the the high reviews and we were not disappointed. We met three of the Vaughn family - Jeanne, Bob, and son were friendly and helpful. The upstairs pool house looks over the large, beautiful, CLEAN pool and was a joy to swim in. The bed was comfortable, the unit is well laid out and location is quiet. This is our second stay at Bob and Jeanne’s. We always feel so welcome and cozy here. They have animals on the property, a pool, pool house and a very comfortable house. The bathroom is to die for and am using some of their ideas for the remodeling of our bathroom. We drove to Lake Tahoe one day. About 2hours depending on North or South Tahoe. Also very close to the Foresthill bridge. One of the tallest in the US. Great place to stay! It’s like being in your own private oasis!! Sometimes your personal excitement and expectation will overwhelm the reality of your selected location. Lay every fear aside, as that is not so with this treasure. The grounds are beautiful and orchard feeling as you arrive. There are views out every window and farm fresh eggs in the fridge. Beautiful shower with premier bathing essentials. We stayed three days...and never left the cottage!! Honestly, the kitchen is top of the line and we had the perfect amount of room in the fridge/freezer combo to eat in all our meals. The bed and couches were comfortable and the decor was current and charming. We only live twenty minutes away...but we’ll be back to this gem for more personal retreat time soon!!! We went for a long weekend in October 2017 and had a great time. Auburn is a really nice town and much larger than we expected. Lots to do in Auburn, if you are bored, it's your own fault. The pool cottage is really beautiful inside and out. Inside is custom built with beautiful kitchen, bathroom, bedroom, and living room. They even supply nice shampoo, conditioner etc. Unfortunately, we didn't get a chance to try the fresh eggs from their chickens, but it's so nice that they leave them for you, as well as fresh coffee and condiments, spices, etc. Lovely stay and would highly recommend it! Thanks Jeanne and Bob!! 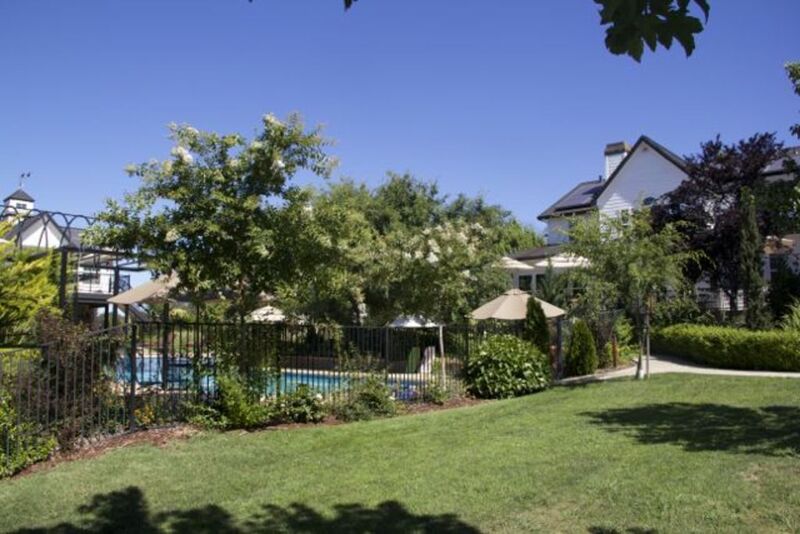 Swimming, sun bathing, ping-pong, outside fire, and volleyball onsite, Five (5) winery tour within 5 miles, all other activities listed in the "on-site and nearby" are within two hours distance. A great place. Only payment through Homeaway is allowed.